The Planeterella sphere simulates a magnetized planet with an atmosphere of CO2 and bombarded by the solar wind. Blue aurorae develop according to its magnetic field configuration. Astronomers believe glowing aurorae of blue, with red and green hues would be visible to astronauts walking on Mars. For the first time, an international team of scientists from NASA, the Institute of Planetology and Astrophysics of Grenoble (IPAG), the European Space Agency and Aalto University in Finland, have predicted that colorful, glowing aurorae can be seen by the naked eye on a terrestrial planet other than Earth — Mars. 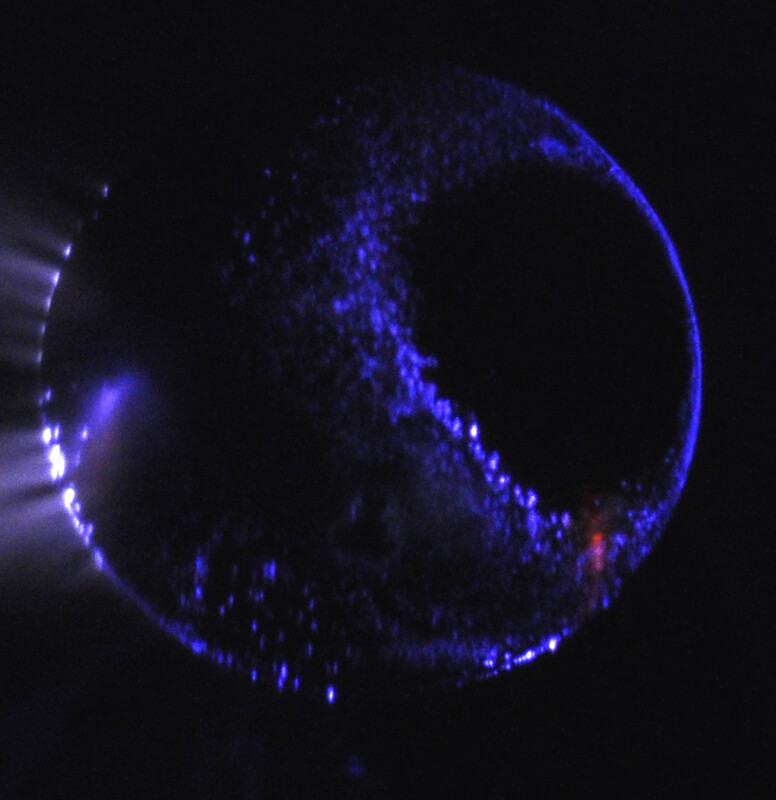 Visible Martian aurorae seemed possible after the SPICAM imaging instrument on-board the ESA satellite Mars Express spotted aurorae from space in 2005. Those observations were confirmed in March 2015 by the NASA-led MAVEN mission, which completed 1,000 orbits around the red planet on April 6, 2015. Through laboratory experiments and a physical numerical model developed at NASA and IPAG, the study shows that, on Mars, aurorae also occur in the visible range. The most intense color is deep blue. As on Earth, green and red colors are also present. Several times during a solar cycle, after intense solar eruptions, these lights are bright enough to be seen with the naked eye. Aurorae occur when charged solar particles reach local magnetic field lines, where they enter the planetary atmosphere and excite its atoms and molecules. As they deactivate, the particles produce light emission. On Earth, aurorae are essentially green or red (excitation of atomic oxygen), but even blue-purple (excitation of ionized molecular nitrogen) can be seen. At the beginning of Mars’ existence and up until 3.5 billion years ago, the red planet hosted a global magnetic field. Although this global field somehow shut down, local spots of increased magnetic fields, called crustal magnetic anomalies, still remain in Mars’ surface. These anomalies are concentrated in the southern hemisphere, where aurorae are predicted to occur. It is predicted that an astronaut walking on the red soil of the planet could look up to see the southern night sky glow blue, with red and green hues. Perhaps NASA astronauts who plan to make their way towards the Mars’ surface by the 2030s aboard Orion will be the first to provide first-hand confirmation of the prediction. And to think, Mars’ southern lights could eventually become as much of a draw to aurorae admirers as Earth’s northern lights. The Planeterella simulates aurorae using a magnetic field, charged particles and a sphere. For this study, they replaced the terrestrial atmospheric gas with CO2, the major component of the Martian atmosphere, and then created a discharge in a vacuum similar to Mars’ upper atmosphere. There are seventeen Planeterellas worldwide. One is located at NASA Langley’s official Visitors Center — the Virginia Air and Space Center in Hampton, Va. — where Guillaume occasionally exhibits the simulation. Be the first to comment on "Researchers Predicted Blue, Red and Green Aurorae at Mars"